WATCH Did the White House Fence Jumper Have Darker Expectations? 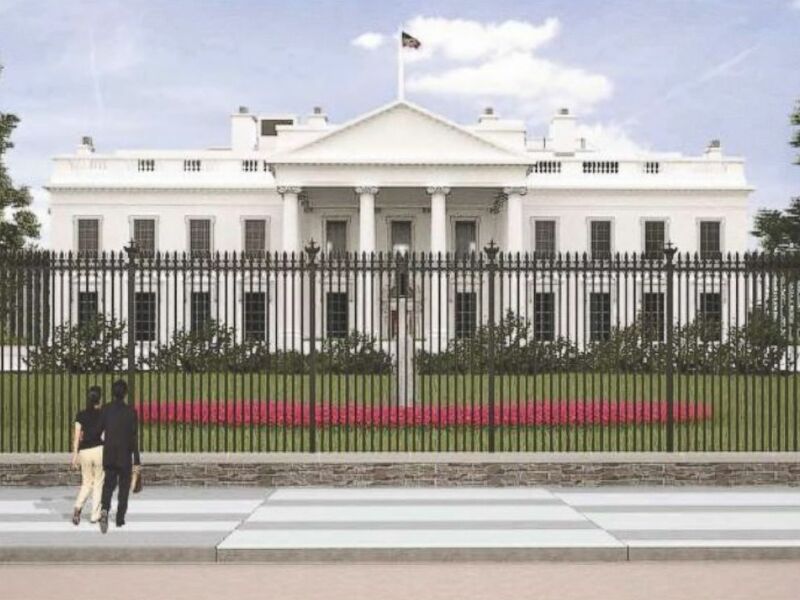 A preliminary design concept for an upgraded White House fence was submitted publicly on Thursday to the U.S. Commission of Fine Arts. The re-design would extend the height of the fence from approximately 6 feet to more than 11 feet. The upgraded fence would also include new security features, such as sensors to detect would-be intruders attempting to jump over top. The goal of the re-design is to make the fence "taller and stronger" with a sensitivity to historic preservation, according to the planners. "This project is the first step in doing permanent improvements towards securing the White House grounds," said Peter May, the associate regional director of lands, planning, and design at the National Park Service. A series of fence-jumping incidents in 2014, including one in which an armed man was able to enter the White House residence, led to calls for new fence. "The current fence simply is not adequate for a modern era," said Thomas Dougherty, Chief Strategic Officer of the U.S. Secret Service. It is "entirely scalable," he said. "We have now a society that tends to want to jump over the fence and go on the 18 acres," Dougherty said of the White House compound. Comparison of current and proposed White House fence from Lafayette Park. Today was the first formal presentation by to National Park Service and the Secret Service to the commission. Members of the commission shared concerns and opinions on the design, such as balancing ascetics along with security and a show of power, the lack of decorative elements on the bottom of the fence and the displacement of trees. "You see a progression, 3 feet high, 6 feet high. I'm glad I won't be around in 50 years when it's 25 feet high. At some point it can't be the same system," said commission member Alex Krieger. Dougherty said the agencies would take the feedback into consideration before the next phase of the proposal process. "Our priority is to maintain the public's access and their enjoyment of the residence because of the democratic connotations of all of that," he said. "It is in fact a quintessential First Amendment site." There are often protests and marches in the park in front of the fence. Existing White House fence from Lafayette Park. The proposal must be approved by this commission, as well as the National Capital Planning Commission. The Secret Service also pointed out that it is moving at comparatively "blazing fast" speed for a government project. "Our agency is under a tremendous amount of pressure to move forward and do as much as we possibly can now," Dougherty said. Rendering of proposed White House fence from Lafayette Park. 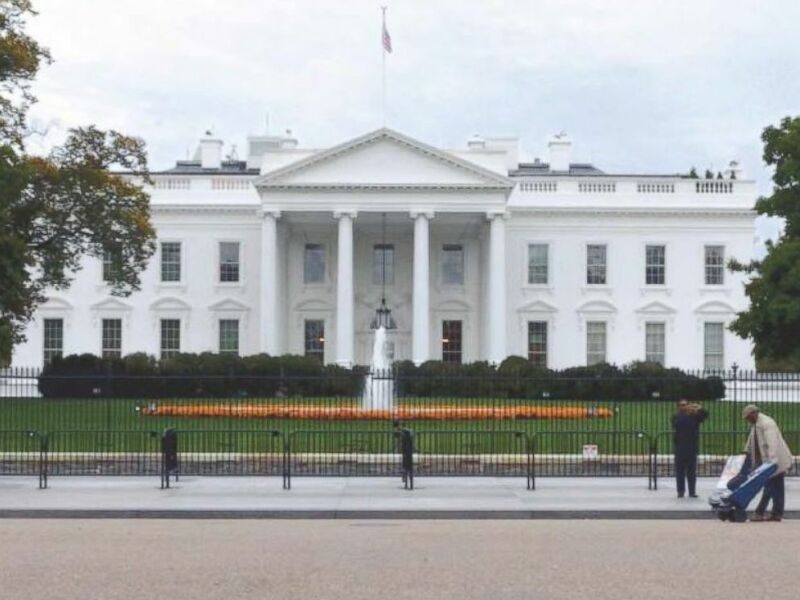 Earlier this week, the Department of Homeland Security Inspector General, which oversees the Secret Service, issued a scathing report on the September 2014 fence jumping incident. Many of the details had been previously known from congressional reviews and DHS reports, but the report made the conclusion that, "although they may have only indirectly contributed to the events of that night, underlying and continuing resource and management issues are negatively affecting the Uniformed Division and, potentially, its ability to protect the White House and its occupants." "In particular, the Uniformed Division is severely understaffed, which has led to inadequate training, fatigue, low morale, and attrition," said the report. 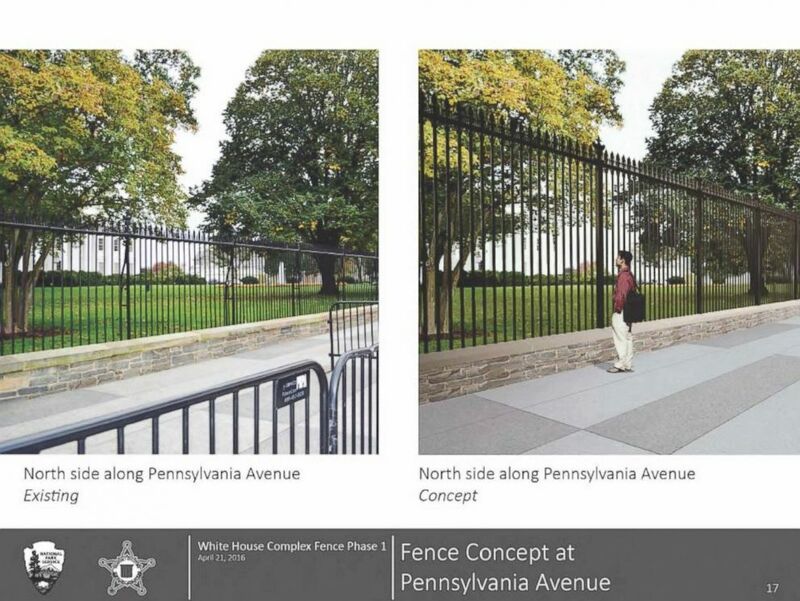 The report also said that the Secret Service should continue inform the Inspector General about its progress in replacing the existing fence and provide updates to the progress. The Secret Service concurred with the findings of the report and said it is taking steps to address the concerns. "There is an ever-evolving security environment that we're constantly accessing and unfortunately the world is changing so rapidly is it's hard to control it," Dougherty said at Thursday's presentation. The Secret Service said it hopes to move forward with installing the upgraded fence in fiscal year 2018.